Do you have a sweet tooth? I sure do! Many weekends it's whole wheat cinnamon buns. A fresh-from-the-oven cinnamon bun with coffee, now that's my idea of a Saturday breakfast that is tempting enough to get the troops out of bed in a hurry! Scnecken (or schnecke), by the way, is German for snail, often used to refer to sticky buns made in the rolled up and sliced fashion. 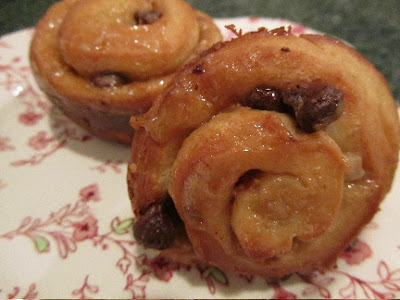 Toffee Schnecken is a rolled and sliced sticky bun pastry, filled with toffee bits, chocolate pieces and nuts. It's baked in muffin tins, so the bun grows up, instead of expanding sideways, and looks a bit like a snail, but in a good way! As luck would have it, I still had a package of toffee bits in the pantry. I bought these on sale, and never got around to using them. I like my Toffee Schnecken with chocolate pieces added. But they're entirely optional. My mom's recipe did not call for the addition of chocolate. So, it's up to you -- chocolate, yes, or chocolate, no. In a large bowl, dissolve the yeast in the water. Add milk, 1/2 cup butter or margarine, 1/4 cup sugar, salt, egg and 2 cups of flour. Beat well. Mix in enough flour to form a stiff dough. 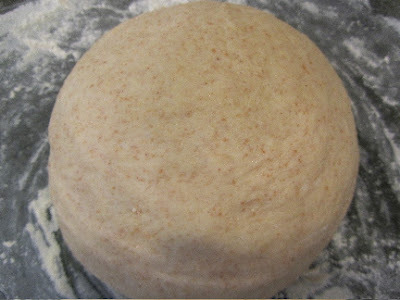 Turn out onto a floured surface, add more flour as needed, and knead until smooth and satiny (about 7-8 minutes). Cover with plastic and a towel. Allow to rest on the counter for 20 minutes. Butter well, 2 12-count muffin tins. 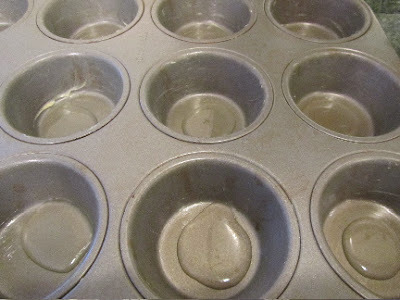 Spoon 1 teaspoon (5 mL) of corn syrup into each muffin tin section (this forms a gooey underside to each pastry). 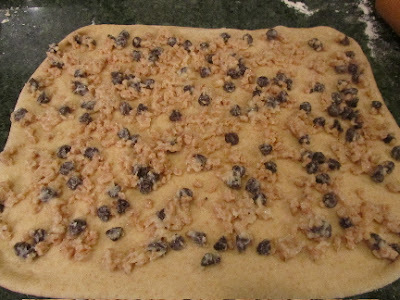 Punch down the dough, divide into 2 portions, and make your filling. On a floured surface, roll each portion of dough out to 12 X 9 inch rectangles. Spread half of the filling onto one rectangle. Roll up, jelly roll style, beginning at the wide end of the rectangle. Slice the roll into 12 pieces, and place into prepared muffin tins. Repeat with the other portion of the dough. Cream the butter and 1/4 cup sugar together. Stir in the toffee bits, chocolate chips and nuts. Cover the filled muffin tins with plastic, and refrigerate for 2 to 24 hours. 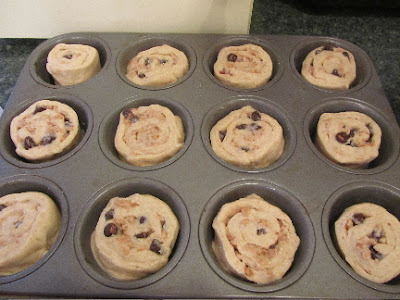 These can be prepared the day before baking, up to this point, for a fresh schnecken in the morning, if desired. They don't require additional rising time -- just set on the counter for 10 minutes and bake. Just before baking, remove from the refrigerator, uncover and allow to stand at room temperature, while the oven preheats to 350 degrees F (176 C). Quickly turn the pastries out of the pan, immediately after baking, onto a rack to cool briefly before serving. If any stick to the pan, slide a table knife around the edges. As the syrupy bottom of the schnecken cools, it will harden. The last couple of pastries may need to be popped back into a warm oven, to remove them from the pan. Makes 24 pastries. I freeze half of the pastries, for grab-and-go breakfasts during the work week. I just do a double wrap in plastic, and I am good to go. Grabbing a cup of coffee and pastry at Starbucks can become an expensive habit, over $4 just for one person. I make pastries at home, as a way to treat my family to something special, in an affordable way. This recipe (made without nuts -- I was out of nuts), cost me about $4 for the batch of 24 pastries, or 17 cents per pastry. A home-brewed cup of coffee and 2 Toffee Schnecken will run about 50 cents. Not bad at all for a Saturday morning treat! 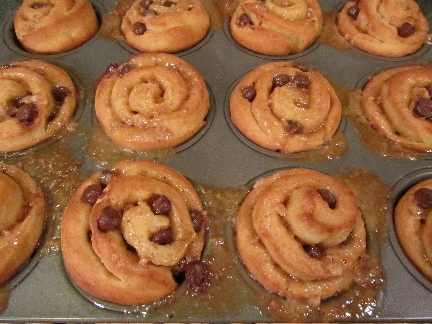 I made cinnamon schnecken yesterday, as I've seen them on several blogs now. I enjoyed one with afternoon tea yesterday and for breakfast but the kids didn't like them. I have a feeling your toffee and chocolate version might appeal more! Next time! Yep the pile of uneaten cinnamon buns looked a bit daunting so some did go in the freezer! One unfrozen one left for tomorrow's breakfast unless my husband gets there first! Set your alarm, or hide that last one behind the spinach or tofu! Schnecken right this moment! 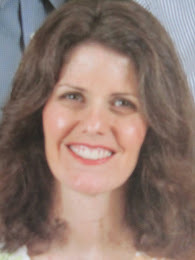 What a terrific recipe- and you always do such a great job with your instructional format!! Thank you! You always have such kind words. 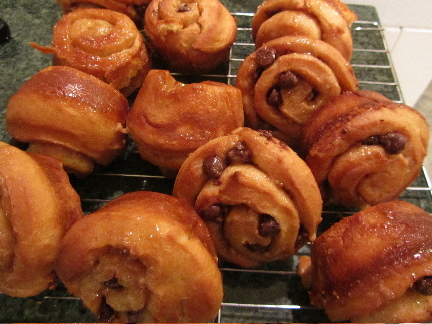 If I could send schnecken out into the blogosphere, I'd send you a plate of them. I do like a treat on weekends! I have only made buns a few times, but I never thought about putting the corn syrup in the bottom of the pan. Interesting. 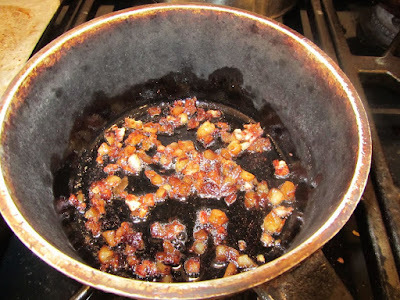 I have a couple of sticky bun recipes that call for something at the bottom of the pan. Often it's a mix of brown sugar, butter and sometimes nuts. Then when the buns are done baking, they are all gooey and sticky on the bottom. But I did notice in a bakery on vacation last year, that they made their sticky buns by pouring a caramel glaze over the top of the buns, instead of baking the glaze in the bottom of the pan. Thank you! Just my way of showing my family that thrifty doesn't have to mean deprivation. And they smelled heavenly while baking! Tomorrow I'll eat healthy. I put on 10 pounds just LOOKING at these. I lovelovelove sweet baked goods. Now go look at some asparagus so you can lose the 10 you gained looking at my breakfast! I love the sweet stuff, too. Baking goodies is what got me interested in cooking when I was a girl. If it weren't for the super early hours that a baker keeps, I have always thought I should like to have a bakery, or an ice cream parlor, or a candy shop. On second thought, maybe it's a good thing I don't have any of those! I would love to work in a bakery. I worked as a cook in a camp kitchen during college and loved baking, especially desserts. We used to mix up a batch of cookie dough and keep it in the walk-in refridgerator to snack on (I know, I know, we could have died from all the raw eggs ... I still can't keep my finger out of the cookie dough but I don't let the kids eat it--double standards!). I had the same double standard with my kids! I did let them have one small spoonful of dough, but no more. Meanwhile, I ate so much cookie dough as a teen! More dough than baked cookies, I'm sure. Now that my kids are all older, I can't exactly police how much cookie dough they eat. But just hope they're sensible about it. I know they look decadent. In my defense, I did add 1 cup of whole wheat flour to make them healthier! Oh, who am I kidding. They were a yummy, sweet, and sticky mess to eat! Sweet tooth? I have 32 sweet teeth! I'd like to make tham but, sweet tooth or no I couldn't eat a batch before they got stale. Yes, because they're a yeast roll, they freeze great. I cool on a rack after baking for about 30 minutes, then wrap and freeze. To thaw, I either set a few still wrapped on the counter for a half hour, then unwrap and heat briefly in the microwave (10 seconds max), or I thaw a few of them wrapped, in the fridge overnight, then unwrap and microwave, about 8-10 seconds. Microwaving seems to bring back the original texture. I have also done half batches. To do this, you need to halve an egg. Beat well, then use 2 tablespoons beaten egg (the other 2 tablespoons of egg can be saved to add to scrambled eggs, or something else). These look wonderful. I like your idea of making a big batch and freezing them to last throughout the week. Yes, a coffee and pastry in Starbucks each morning can really add up. Thank you. Yes, like many households, we are quite busy in the mornings, and having something ready to eat is a tremendous help for me. And the pastries are a nice change from our two standard weekday breakfasts of oatmeal or toast. These look super-tasty :) The thing that gets me with coffee shops is that they sell slices of banana bread for $3-4, when I could make a whole loaf for less than that at home. I know! Especially with the banana bread, muffins or scones -- $3-4 a piece just seems ridiculous, when they are so easy to make. And I often make mine healthier, too, by adding whole grain flour and reducing the sugar a bit.